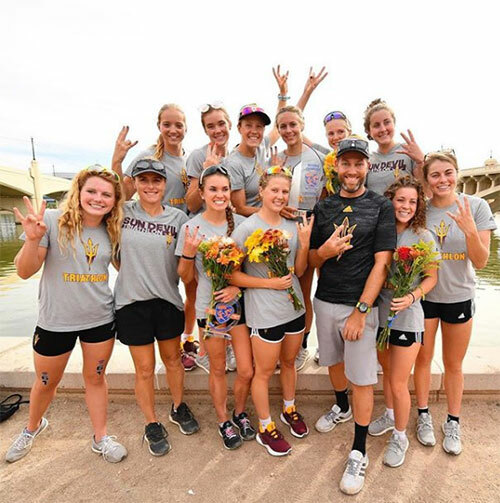 TEMPE, Arizona — Arizona State University earned a dominant victory Sunday at the Women’s Collegiate Triathlon National Championships, claiming the NCAA Division I team title for the third consecutive year. 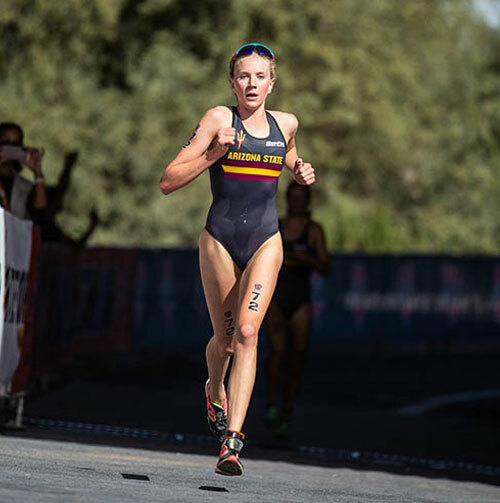 The course, centered at Tempe Town Lake for the second straight year, featured a 750-meter swim, draft-legal 20-kilometer bike and 5-kilometer run. ASU brought a stellar team to the DI/DII race, including the trio who swept the 2017 National Championships individual podium: Hannah Henry, Charlotte Ahrens and Kyla Roy. The University of South Dakota’s Leah Drengenberg was first out of the water, but five of the six athletes in her wake were from ASU. Soon, a five-strong lead pack would form on the bike, including four Sun Devils — Henry, Ahrens, Roy and Katie Gorczyca — and USD’s Drengenberg. By the time they hit the run, the podium looked almost certain to come from those five. Henry ultimately ran away with the win, clocking a 19-minute, 15-second 5k to break the tape with a total time of 1 hour, 1 minute, 53 seconds. Ahrens was right on her heels to take second in 1:01:58, and Gorczyca completed the top-three in 1:02:19. Race report by Jessica Welk at USA Triathlon.